So What is Mindfulness? Basically it is about being fully in the present moment and being able to observe your feelings, thoughts and bodily sensations, giving you some objectivity rather than being immersed in them and overwhelmed. It is a skill developed through meditation, which can be in many different forms from focusing on a physical activity (I used to do it while washing up!!) to sitting quietly at peace for 10 minutes or more. It is not only a skill you learn once by going on a course but it requires practice and can become more a Way of Being, ‘Being Mindful’, rather than a technique labelled ‘Meditation’. Why is it Challenging when it’s meant to bring Inner Peace and Greater Clarity?! 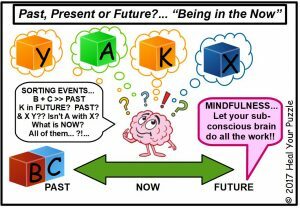 Part of the skill in aiming to stay in the Present is that your Mind is challenged to sort information into Past, Present or Future… a huge reason as to why we get stressed in the first place. Much of what we think about is either Past events that we cannot leave behind or what will happen in the Future… and further on from that… how all the events correlate together…. this is the challenge of training the Mind. So Mindfulness is not only about observing your thoughts and feelings, although that is the initial aim to help you manage yourself but it is also about you training your Mind to sort and organise your experiences sub-consciously rather than consciously thinking about them all the time! Stress! !